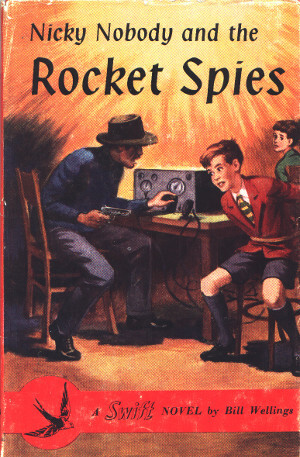 Nicky Nobody and the Rocket Spies. A Swift Novel. Nicky receives a camera as a birthday present. He takes a photograph and, when it is developed, sees something on it which should not be there. Finding the solution to the mystery leads Nicky and his dog Chum into an adventure in which the excitement lasts right up to the final page. Dimensions : 13cm x 20cm with 131 pages. "It's for you," said Sir Giles. "A little birthday present, something to keep you out of mischief." "It's smashing, but I haven't got a clue how to us it." "Well, I read all the instructions thoroughly and decided that I could only learn more about it by trying it out." said Nicky proudly. "It looks like a first-class job to me, Nicky." "This may be a real clue. Come on, Chum," he said to the little dog. "I say, it's super, Barnes," said Nicky. "We can have lots of fun enlarging our photographs." "Either someone keeps setting up a pole and taking it down again near the old barn on your father's farm - or else Nicky's camera is haunted." he said grimly. "Who is this mysterious stranger, Nicky, and what is his car doing in the old barn?" "Calling HS2. Calling HS2. Come in HS2." "The door," she shouted from the other side if the room. "It's - it's locked!" "Twice you have caused me troubles. Zis time I kill you for sure." "Golly!" Nicky exploded. "We've got to stop him." "Well, let's get cracking. We've got to catch that scoundrel and we won't do it by having a picnic here!" "Devil's Cove is the place," he assured Nicky. "Well," commented Sir Giles, "this looks interesting." "Home, James, and don't spare the helicopter."